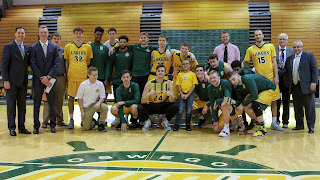 OSWEGO, N.Y. -- The Oswego State men's basketball team continued its dominant play with a 28-point victory over SUNY Poly in Saturday afternoon's Max Ziel Tournament title. While the Lakers claimed the championship, Brandan Gartland was named the tournament's Most Valuable Player and teammate Joe Sullivan joined the junior on the All-Tournament Team. The Oswego State men's basketball team - and Brandan Gartland of Webster - continued their dominant play with a 28-point victory over SUNY Poly in Saturday afternoon's Max Ziel Tournament title. While the Lakers claimed the championship, Brandan Gartland was named the tournament's Most Valuable Player and teammate Joe Sullivan joined the junior on the All-Tournament Team. Location: Max Ziel Gymnasium - Oswego, N.Y.
A pair of Quinn Carey 3-pointers coupled with two Tyler Pierre lay-ins and a Sullivan trey made it 13-6 less than five minutes into the game and the Lakers never looked back. Oswego's largest lead came late in the second half, pushing the advantage to 30 at 88-58. Overall, the Lakers controlled the lead for 97.1-percent of the tilt. Carey paced Oswego with a game-high tying 20 points, which included six makes from long distance. Sullivan earned his first double-double as a Laker after narrowly missing on in Friday's victory, scoring 10 points and grabbing a game-high 10 boards. Gartland followed up his 26-point explosion on Friday with 17 points in the title contest, going a perfect 7-for-7 from the charity stripe. Sullivan was also perfect from the free-throw line (4-for-4), helping Oswego to 86.4-percent (19-for-22) shooting on freebies. For the second-straight day, Julien Crittendon reached double-digits in the points column, scoring 13 in just 17 minutes on the floor. Joining the double-figure scorers was Pierre with 12 to go along with seven rebounds. Point guard Liam Sanborn led both teams with 34 minutes played and filled the stat sheet in that time. The sophomore distributed nine assists, scored eight points, collected six rebounds and turned the Wildcats over once. As a team, Oswego more than doubled SUNY Poly on the glass (43-20), exactly doubled its opponent in assists (22-11) and owned an impressive margin in second-chance points (22-4). Prior to the Thanksgiving weekend, the Lakers will remain home to host Clarkson University at 5:30 p.m. on Tuesday.